The transferable skills developed over the course of a PhD have been a recurring theme on this blog. I have blogged both about being trained and, later, about training other students, in the skills that might be useful beyond the office, lab, and thesis. This Christmas, those very transferable skills I developed came into their own in an unexpected way on our wedding day. Cultivating the ability to think flexibly is important during PhD study. When research is underway, plans often change, and you need to be able to think about novel solutions in order to avoid getting stuck. This was true on our wedding day too! 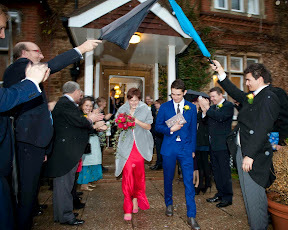 A last-minute organisational twist meant my husband-to-be was the one to pick me up from my parents’ house and drive the two of us to our ceremony. Luckily I am not someone who sticks slavishly to tradition, because this led to one of my favourite photos of the whole day. Off to get married! Via jjcule on instagram. 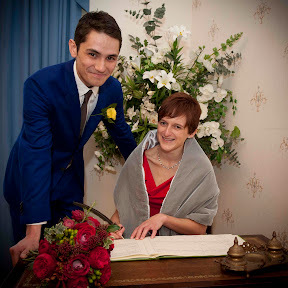 In common with Frank, we had our ceremony at a registry office. I thank the registrars who made our ceremony moving and meaningful. 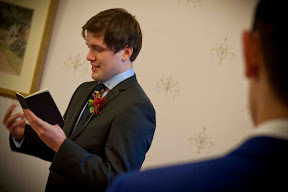 A particular shout-out to my brother Ant, who stole the ceremony show with a reading of his poem Oh Brother! (Brother of Three Sisters). What do you mean, I can’t do this in Emacs? The ability to adapt to unexpected findings came to the fore again as we left the registry office, when the traditional shower of confetti was replaced by a traditionally British erm, rain shower. Note the redeployment of umbrellas as a wedding archway. About eighteen months ago, I collaborated with Ant on this blog post about giving a scientific talk. 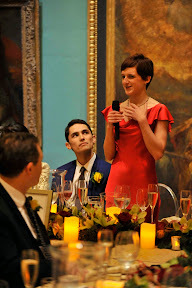 At the time I did not imagine the day I would apply the advice given there to my wedding speech. The night before the wedding, in a last-minute rehearsal reminiscent of those I did for my conference presentations, I practised in front of a friend who had given a speech at his own wedding less than one year earlier. He reminded me that when speaking at your wedding, the audience are on your side. This is in contrast to speaking at a scientific conference, where the audience can be bored, contrary, or, if you are unlucky, downright hostile. 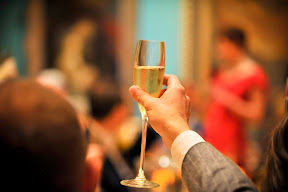 The guests at a wedding are more likely to support you and to laugh in the right places. With a combination of Ants’ tips in mind and my friends and family in the room, and the experience I had giving talks over the past few years, I quite enjoyed giving my speech. Thanks go to Guildford Registry Office (for a meaningful and touching ceremony), The Watts Gallery in Compton (for the use of their beautiful venue), Daniel J Norwood (who took the photographs), Rhubarb (who catered) and Carrie at the Topiary Tree (who did the flowers). Most of all, thanks to friends and family, and especially to my parents, who made it all possible, in more ways than one. And thanks to my Shiny New Husband, too, without whom the past eight years would have been a lot less fun. This entry was posted in Life and tagged Transferable skills, Wedding. Bookmark the permalink. Charming photos and you both look so cool and lovely. Congratulations again – lovely photos! And I whole-heartedly agree on the public speaking – poor Mr E Man NEVER has to speak in public as part of his job, and he was therefore much, much more nervous than me.